Where is my robot maid? This article, Amazon Has a Top-Secret Plan to Build Home Robots, is making the rounds but it is kind of depressing. (It is also depressing how many other articles are coming up in Google searches that are just book reports on the Bloomberg article without any getting new details on their own. Bot journalism I guess.) Anyway it makes it sound like we'll never get robot maids. In part because we do not want them. WTF?! I've been wanting one forever! Have you ever met someone that did not want one? OK maybe not for the quoted price but an affordable one sure. When the Hero came out back in the 1980s they seemed just around the corner. Then the whole electronics DIY market seemed to stumble there for a bit while a lot techie types moved into programming for awhile. But the dream was still alive. Google beer fetching robot for example and you get loads of links and videos like this one. Yet despite having fairly decent voice interfaces, wide spread wireless data links, relatively cheap drones that can follow and pan you around and avoid obstacles getting home, much less self driving cars, most bots seem about as advanced as the Heroes we had back in the 1980s that had nothing but an 8 bit CPU and a floppy drive to work with. So what is the hold up? I don't need a human looking android or even something that walks on legs, which seems to be the focus these days. Show me something that looks like a Johnny 5 and can do laundry and such on its own for a few grand and I'll preorder it now. Look at the ER1, a platform from over 15 years back now that was basically a frame that you mounted a laptop into. One of the sample tasks was waving a bottle in front of its camera and it would go get one. It was like $700 (with optional arm) plus laptop. I went to a demo they were doing at Frys, got there like 5 minutes before it was supposed to start and was told the salesman had already left because he did not think there was enough people there to make it worth the effort. If only he'd waited to see all the people that left work early to get there after he'd gone. Then I decided to just get one direct online but for some reason they decided to sell only to schools. What you won't even take my money?! Looks like they are out of biz now. Wonder why. Which goes back to my point, we had these 15 years ago. Why don't I have one that can do the laundry by now? We have hardware now that way out performs what we had back then including CPUs, cameras, recognition systems, motors and batteries so it should be simple to at least market something better than we had 15 years ago. The latest security cameras for example do face and even pet recognition of them walking through a room and only cost $299. That was SciFi 15 years ago. Another example NiCad batteries were still a thing then. Look at this laundry folding robot that was making the news not long ago. Comes in at about $1K and you still need someone to load it? It is little more than this folding board you can get for $10. Why not make it a bit more, put some arms and a camera on it so it hang and or fold the stuff in the dryer and then move the laundry from the washer to dryer? Got room for basket it ought to be able to sort colors and whites at least well enough to make loads too. If you have room for a couple baskets you could pre-sort. Extra points if it is mobile and can be moved into the kitchen to do dishes. Which brings me to this self proclaimed THE WORLD'S FIRST ROBOTIC KITCHEN that was in the news this week. $75K and all it does is cook and maybe the dishes. It looks like it is actually a kitchen with arms. But from the video it still looks like you have to setup the ingredients for it. They also show it closing the top loading dish washer but not how it gets the plates to put in it. It might make sense in a restaurant but you would have to be the kind rich to have a cook on staff to install one at home. And again they go on about how life like the hands are. Why does a kitchen appliance need life like hands? How much cheaper is one with grippers and snap in tools instead? The inventor says $75K is about the same price as a standard kitchen but given the median home in the US is $326K I'm not buying it. Anyway a robot that can do the laundry would seem it least as useful plus a lot easier and cheaper to build. Not to mention retro fit, especially if it is mobile and only needs to be placed in front of the washer and dryer. So in closing Amazon I truly hope you are going to get us something as useful as Alexa has been and not just an Alexa powered Jibo as the the article implies. We do not need an Alexa with more personality. We need one that is mobile with arms. Still not clear on who ml314.com is but their cert is expired and blocking them seems to have no affect so I did. Same with the other expired certs that came up. 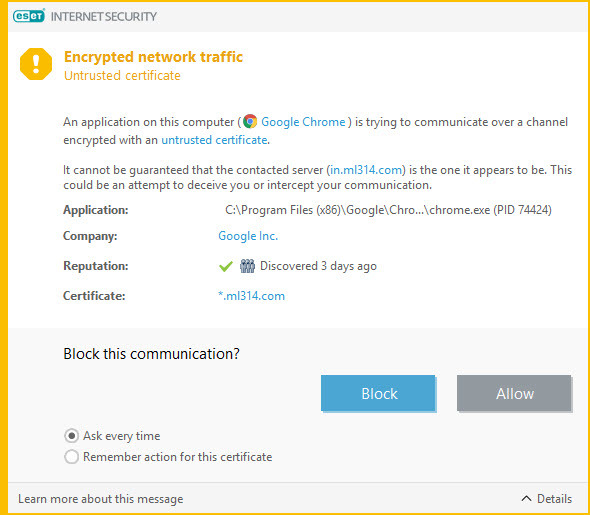 If you see a pop up telling you cert is iffy block it. If you have other blocking tools add that domain. Adremover, the one I was using, was the most downloaded of the ad blockers in the extension store. It was downloaded by 10 million! It also was blocking so much stuff that I had to keep turning it off to use a lot of sites. I'm not sure how long Adremover was off before I noticed but I think all the expired cert warning started about the same time. So I'm not sure calling it a "fake" ad blocker is exactly accurate. As a stop gap I upped my OpenDNS filtering to include "Adware" and "Hate/Discrimination" though it does not seem to be stopping all that much. I'm guessing that is because so many sites are moving code to sites on blocked lists and adding other blocker detector to try and force us to turn them off. Note I have no problem with ads as long as they are vetted for malware and do not slow the page loads to a crawl but responsible advertising seems to be mighty rare these days. With just my workstation plugged into the modem I'm not really seeing much of an improvement in download speed but upload is better than expect and that was my bottleneck. 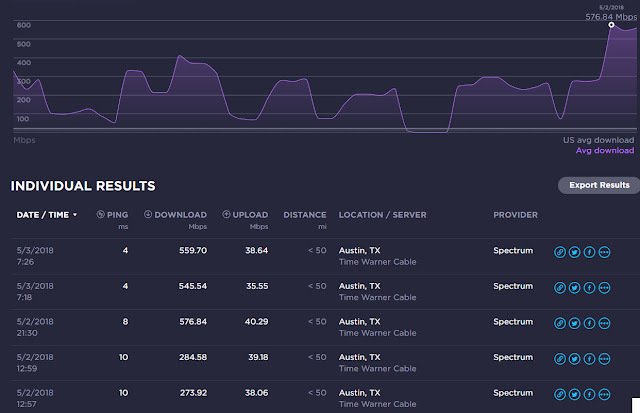 The cable guy's meter was showing over 900 Mbps down but I did notice it jumped up from ~350 to over 900 close to the end of the test so it is probably a burst speed more than a solid speed. This seems to confirm what I'm seeing. New Spectrum GIG no where near 940 Mbps But then I do not see buffering watching HD content even while running speed tests and downloading updates all at the same time so I don't think download speed will prove to be an issue anytime soon. There was a bit of a mix up and Starz was not in the bundle I got so had to add that again. Still ended up adding Showtime, Cinemax and Starz plus doubling my upload speed for less than $20 more a month. Not bad. One weird bit though is I seem to have lost channel 511, HBO HD east. They have no clue why. Error says temp issue so maybe will sort on its own. Since I almost never watch live, picking up on the west feed is not biggie. The new internet setup is kind of strange too. They bring out a modem AND a router. Seems you do not need to use their router and it does not have the phone interface so you need to keep the old modem/router as well just for the phone. Instead of using their router I think I'll stick a pfSense box instead. I was planning on adding one anyway later. I'll need to rewire some stuff though so I'll be on and off probably for the rest of this weekend. I put one of my old NETGEAR Nighthawk R7000 from before my Unifi conversion in place while I got OPNsense installed This turned out to be VERY bad for throughput but at least I had some protection while I got OPNsense ready. So now I'm setting up OPNsense. From what I'm reading in forums and groups, OPNsense is a fork / more user friendly version of pfSense so I decide to go with it. Also see pfSense® vs OPNsense®: technical comparison and this compare from a guy that installed both. 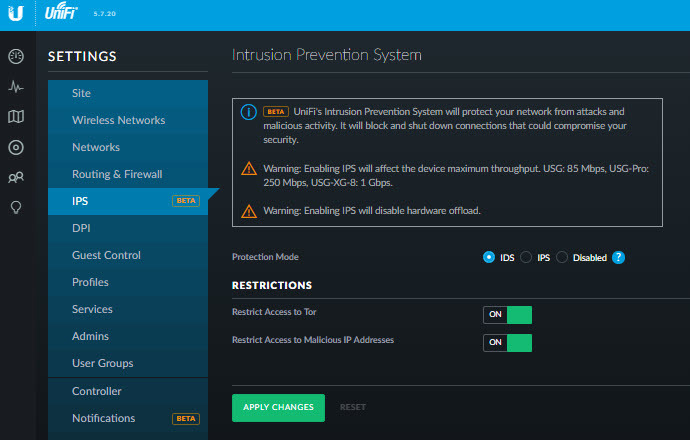 One of the co-founders of pfSense joined Unifi awhile back and the additions they are now making to Unifi fall somewhere in between OPNsense and pfSense from what I as a user see. As I mention below though it seems unlikely current Unifi hardware will be able handle the load of processing high bandwidth data so going with a standalone box makes more sense for probably at least the next year. I'm using a Dell 745 with an Intel(R) Core(TM)2 CPU 6400 @ 2.13GHz (2 cores), CDROM drive, 2 TB HD and 8 GB RAM. It is just spare I had been using initially for OpenShift testing but is not really powerful enough for any real projects I do these days but well beyond what a Unifi USG can do with a dual-core, 500 MHz processor, 512 MB DDR2 RAM and 2 GB of storage. Install went smooth (the occasional label did not match the instructions but it was generally obvious what to do next) except for one thing. The DVD image failed half way though coming up because it seemed to be unable to find the USB DVD drive I had booted from. I had even less luck with a USB stick image as they would not even boot but that might have more to do with the age of the PC I'm using. Note when installer the new machine I found the installer went through without error the second time but got the same CD not found error the first time so this might just be an intermittent issue. From the picture above you can see It performed well as a router even after turning off hardware offloading but when I turned on full IPS it took a real hit. The CPU usage is frequently hitting 100% though so I think that is at least part of the problem. I'll need to try swapping in a Dell 780 with a Intel(R) Core(TM)2 Quad CPU Q9550 @ 2.83GHz box and see it that improves things. For now though it mainly seems to be affecting download and upload so not pressing. 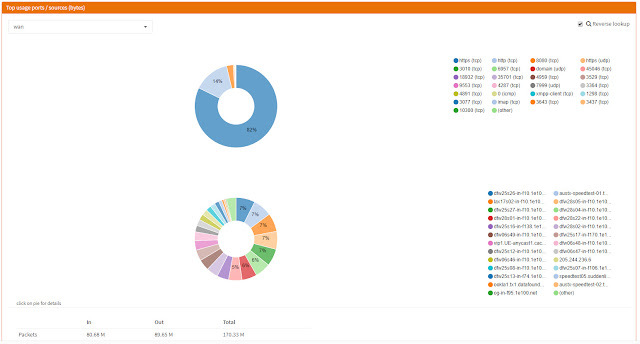 This is what the dashboard looks like (WAN IP blacked out here of course). 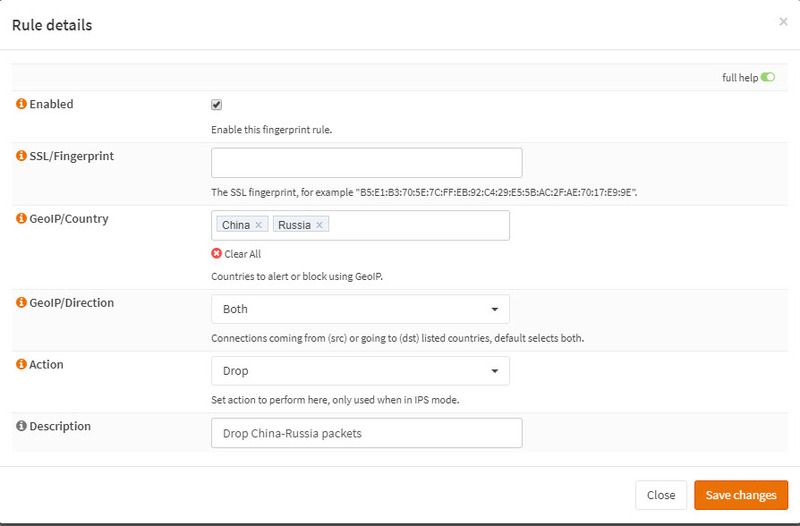 Just unchecking IPS mode on the OPNsense Services: Intrusion Detection: Administration page, but leaving IDS enabled, pretty much gets us back to normal. Having IPS on was also causing check for updates to fail. So far the traffic reports look about the same as what I'd get from Unifi though in my case it helps me to filter just what is talking or not talking to the outside world. Otherwise Unifi pretty much wins here. Unifi has a similar geo filter but currently you can only have on where OPNsense lets you have many. An IP that appears to be in Netherlands though the attached phone number and some of the contact info is Czech. Have to say I like the amount of stuff you can cram onto the console. Her I have it in 4 column mode and this is not even everything you can stick on there. Surprised there seems to be no way to hide or shrink the left nav menu as customizable as the rest is. Seems checking Permit password login does not seem to work. You still need to use ssh keys. So as a work around I copy pasted into vi from a browser. Note you will need to change the first line from python to python2.7 either way so it can find the python command. Update it appears the crontab is getting overwritten so you may have to redo this from time to time. This should add a line to the crontab but does not seem too. Nor did it run at first even after reboot but then started running later. No obvious reason why but the line I manually added to the crontab disappeared about the same time. Still not adding a line in crontab though so being handled else where. The LAN interface switched from 192.168.0.1, the static assigned, to 192.168.0.201, a DHCP address, at one point for no obvious reason. Sometimes the Speedtest.net extension just seems to hang when run while on the dashboard page. 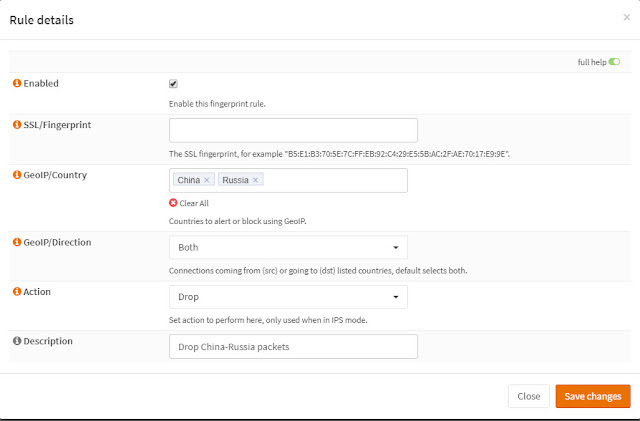 As mentioned above check updated fails with IPS on. It appeared it was because the Core(TM)2 CPU is just not powerful enough to handle both at the same time. But I'm seeing the same with the Quad Core and the CPU is under 40% max. Note on Snort. There are a lot of Snort rules. I filtered the list for "snort", selected all then enabled selected which enabled about half of them. I then also enabled Snort VRT/blacklist. Note the much improved CPU usage. That upload is way low but after turning off IPS I got an even worse run and then a slightly better one which makes me wonder if the speed tests are telling me anything. External factors must be throwing them off or something is causing flux in the OPNsense box I can't see. Note the CPU usage has actually gone up even though IPS is now off which makes no sense at all. And Speedtest with IPS back on. Doing more research Seeing 0% packet loss after repower but back to 20% and other weirdness within an hour. Swapped out the 1 PCIe x1 network card (WAN side) and the 2 PCI cards (the slots the mother board had open) with a 4 port PCIe x4 card in place of the unneeded video card in the PCIe x16 slot and things have improved a lot! The next morning I was still seeing 0% packet loss and higher speeds than I had connected to the modem directly. Last night I even hit over 40 Mbps up. And IPS on with the same ET and Snort rule sets as before. Update: 5/17/2018 This are looking better though the results to vary a good bit. There is about 40 mbps down and 5-6 mbps up going on besides the speed test. The fastest download test I was only seeing 8 mbps up because of how fast the security cams were triggering and transferring alert pics to the cloud that day. I also added a Pi-Hole DNS filter which has shifted some load from Chrome and the OPNsense. 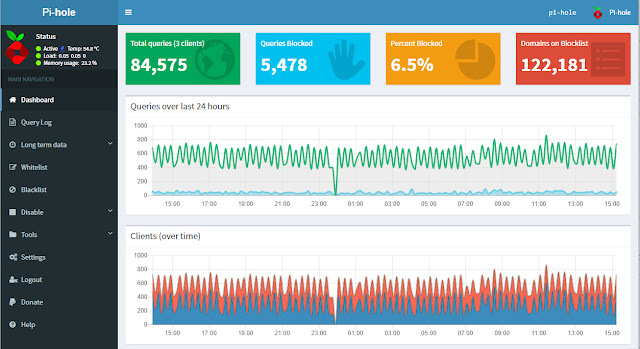 To give you an idea here is the dashboard showing the number of DNS requests it is handling. Simple to set up with these instructions. Just in time too as the ad blocker Chrome extension I had been using got caught doing stuff. Optionally change the host name. you will need it to login to the admin web interface. Lastly you should backup your config any time you make changes like adding sites to a whitelist. If you are recovering from a crash (this has happened a couple times to me) you can also import your config from this screen (Settings->Teleporter) as well. Answer to "I'm new what camera / automation should I get?" What do you have? Are you starting from scratch or do you already have an investment in a good bit of gear. Maybe you have stuff but are cool with dumping if need be. Factor in time and money here. What skills and or eagerness to learn do you have? Are you good at programming or hardware building? Are you looking to learn or are you looking for something as easy as possible? The people you will get answers from will be from all over the spectrum, Something one might do everyday will be unthinkable to another but both will throw suggestions at a general question. What kind of budget in money, time and style? Note here often you can save a bit of money building something but the extra time required and or the lack of style of the finished product will make the savings over a produced item seem worthless. This is VERY subjective. Even if you are not rich you will be making compromises. You need to decide what you can live with. Note lots of people will weigh in on the vaguest question to put forward with whatever they did (or in some cases just Googled) as being the ultimate solution for you. Be sure to weigh any responses you get like you would Amazon reviews. As in have they actually done what they are suggesting. If so how long have they been doing it and how does their skill set match yours. That said there are some basic things to keep in mind especially with cams. Wire your cams. You have to run power to them anyway (do not get battery powered ones) so you might as well run cat 6 and power them through that. Only record to the cloud as a backup. Get a NVR like Blue Iris to record local. Record 24/7. Recording on motion will get most stuff but usually misses that one thing you REALLY needed to get. Think about what you want the camera for. 720p is fine if you are mainly looking at stuff up close or letting you know someone is there but if you want to have a pic the police can use you will need something with enough pixels to work with at the max distance you might see them at. This applies to viewing angle as well. The wider the angle the thinner you are spreading those pixels. Cams that also record to an internal card are good idea too but as a backup. Cameras should only talk to the NVR and be blocked from talking to the outside world. I have a lot of notes, tips and compare pics of most of the cameras I've tried in my other blog Security Cam 101 give it a look to see what looks like a fit for you. People call anything from simple remote control of a bulb to multi room scenes that happen automatically based on conditions automation. Odds are you looking to do is somewhere between remote control and what is possible. If you are reading this odds are what is possible is way more than what you might think. The only real suggestion here is get a hub and look for devices that work with multiple hubs to keep your options open. This blog lists a lot of the stuff I've tried and some of the issues I've dealt with. I also have a matrix of hubs and devices I've tried tracking how well each worked. As a first hub I generally suggest SmartThings or Vera as they are both fairly cheap and simple to set up. I've also heard good things about Wink and Hubitat but have not tried them myself. When you are ready to go whole hog you can upgrade to Homeseer which costs more and is aimed more at the installer market but does almost anything you can think of except talk directly to Zigbee devices. Gateways / sub hubs like Hue are good too just try and get ones that do not need to link through the cloud. In a similar vein you can use your automation sensors for an alarm system if you really do not think you need an alarm and just want something simple. But if you think you need an alarm get one that is separate but talks to the hub you decided on above. Voice data bandwidth, a quick test, could Alexa listen all the time even if they wanted too? These are the same devices that supposedly do not have the ability to let us select our own trigger word but will be listening for variations of I like or hate that? Does not add up. In theory they could stream all your voice to the cloud servers but that quickly starts taking up some serious bandwidth and server resources. Plus for all that, all they are going to find is I love my pets and hate slow computers and the cable company. No news there. Given the false triggers both my Alexas and Homes get they would build more of a profile of the characters I watch on TV than me. They would have to sort the whole speaker recog first. Alexa still is having big issues with that. Being able to read your emotional state is simple be comparison and they are still working on that. Then there is the whole I'm commenting on something I'm looking at instead of what Alexa last heard too. Most likely here they are looking to cash in if someone attempts such a silly thing. But as part of that I tried to find just how much data a request takes. I could not find an actual spec online so I asked my Echo Show and one of my Google Minis the time. The Mini used 254.5 KB processing the request and 26.7 KB while I was talking to Alexa. Alexa used 213.6 KB processing the request and 0 KB while I was talking to the Mini. By comparison my Roamio TiVo used 12.9 during both exchanges. That was way more than I expected and puts this even more in doubt. It takes roughly a second to say "what time is it" so those are pretty close to the kbps rates the devices sending your requests at. 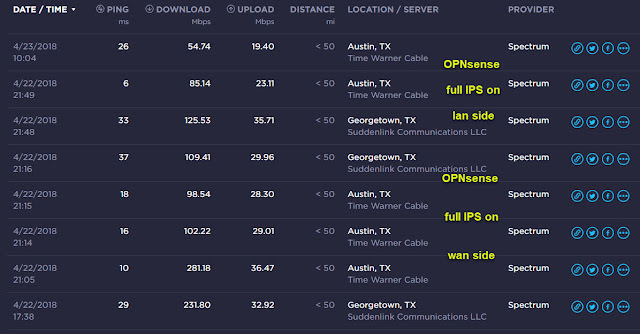 So say 5 of them streaming continuously would swamp the 1 Mbps upload speed of many US ISPs. 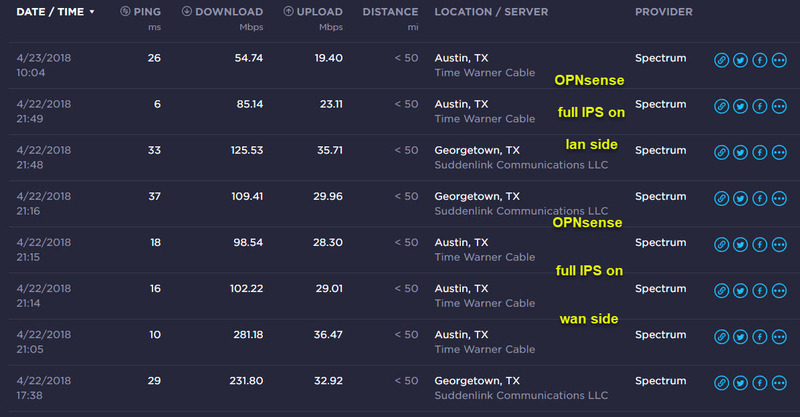 Granted a lot of ISPs are advertising "up to" 5 Mbps upload now but that is still a lot especially if you are using the ISPs router provided WiFi. Then there is the other end where a server now needs to handle not only usual requests, say a 30 a day. That server has gone from processing and average of 74 bps total (over a day) to 213.6 times the number of devices I have every second of every day. That is 2886 times the amount of data needing processed now. The other assumption that they are going to move some of the processing local for this, even though they say the devices to not have the horsepower to handle user defined trigger words. This would seem to be squashed as well given the amount of data sent just to process "what time is it". Google Home vs Amazon's Alexa for voice control of automation. I see someone ask this almost every day in one of the automation groups. As hard as these guys are working to out do each other which is better ALL depends on what you want to do AND what day it is. There is no sign they will even play nice with each other so you still probably want both for the near future if not long term. To answer which is better for you, if you have to have just one, you need to fall back to the old list method. What is it you want from voice control? Any deal breakers? Now look at the latest (like within the last week) reviews and announcements and check off your list. Seriously though if you are getting into home automation $50 is not that much to risk on just trying them both out. Each of you sensors and controlled devices is going to run about the same $30-50. Keep an eye out for sales and you could get a Dot for as little as $29. Google express and Wal-mart had a deal going on for months where you could get $25 back on the $50 price. Talking to home automation is at least 80% what I use these for. The remainder is almost all adding stuff to lists and alarms / reminders. So here is an exchange I have almost every day which drives me nuts and to me sums up the argument as far as which is better for home automation voice control is concerned. It is not always this bad but it has been all too often. Home: Sure for that you might to ask Harmony. Would you like to try that? Home: I was unable to verify your voice. Please try again or adjust setting in app. Sometimes either will even work first try. It is interesting to note though Google always knows I want TiVo and only fails allowing me to turn it on while Alexa fails realizing while there is no TV on my list there is a TiVo. It would seem Alex's problem would be easier for developers to fix given it has a list of items to compare to what I asked for. As in if item is not located, do fuzzy search and ask did you mean [closest match]? Another example is Iris3 (my north security camera server). Alexa has no trouble at all with Iris2 and Iris4 but is almost pathological in not understanding Iris3. While Google gets it right every time. On the flip side, I like Alexa's integrated list features better (though both are lacking in my book) and when I'm ready to go to bed I say Alexa, wake me up at 7 AM [pause for response] Goodnight and kicks off the event which confirms everything and if is puts house into sleep mode. I think can almost to the same with Google too (you need to use the word and between command phrases) but the Alexa sequence works well and feels more natural to me. It is also kind of cool that with follow-up turned on (the bit that let's you ask more than one thing with out saying her name again, usually) you can say "thank you" to end an exchange and she gives you a random friendly reply like "You bet!" So for today anyway I'm leaning Alexa. But I have the mix. As of this writing I have an Echo, a Home, a Show, 2 Minis, 7 Dots and 2 Wands. Oh and as far as answering general questions I think Google has been able to answer about 10% of the time and Alexa about 5% but that could well be what I'm asking. I finally defined TV as an alias for TiVo. That worked for awhile then it started saying it it could not find TiVo (literally Tee Vo) as a device. Currently when I say "turn on Tivo" I often get "can't find that channel" then "can't find device Tivo" then finally it works on third try. Oddly it does seem to get Iris 3 better these days. Since the above post I add a 3rd gen Dot for over half off mainly just to try. I also added a Fire tablet 8 and 3 Fire tablet 7s (3 for $78 on sale Prime day!) connected to external speakers as virtual Amazon Shows that can also run the Homeseer app to play announcements plus display / control connected devices. For the most part the Fire tablets work great for this though they do seem to lose contact with Homeseer from time to time. On the plus side I picked up a couple pairs of Echo Buttons during the holiday sales for just $14 ($7 a button). You can hang up to 4 off an Echo device. Note one downside is you do not seem to be able to give them a name and the names they get are pretty useless like EchoBtn2LB and EchoBtn2WT. Personally I find more and more I'm only using my Google devices for non automation related actions. I have not felt the need to add any. When the Alexas screw up I just reach for a remote, button, tablet or browser depending on which is closest. Last my Wands do not seem to even be able to tell time now. They are still connecting WiFi so hard to say what changed without doing packet level debug. Since they were pretty much worthless when they did "work" I do not see much point in trying to sort what is wrong.